Line a large baking sheet with parchment paper. Place the chocolate chips in a microwave safe bowl, or 2 separate bowls, if you'd like to swirl two different chocolates together as pictured. Microwave for 1 minute at 50% power. Stir the chocolate and then heat another 30 seconds, stirring again and repeating once more only as needed, until the chocolate is soft and can be stirred completely smooth. It should take about 2 minutes total, depending on your microwave. Stir 1 cup of marshmallows and 1/2 cup of peanuts into the melted chocolate. 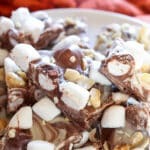 (If you are swirling two chocolates together, pour the second bowl of melted chocolate into the first bowl with the marshmallows and nuts, and stir very lightly to swirl.) Pour the chocolate across the parchment paper and spread to about 1/3" thickness. Top with the remaining marshmallows and peanuts. Chill in the refrigerator until the chocolate has set, at least an hour. Remove from the refrigerator and break or cut into bite size pieces. Enjoy! I like to use the microwave for melting chocolate most of the time, just remember to always use 50% power and check it regularly. A few extra seconds will burn it and there's no recovering the chocolate at that point. If you have a few extra minutes, a double boiler or a glass bowl over a simmering pan of hot water works to melt the chocolate beautifully with almost no risk of burning it at all.